Scientists have predicted that by 2050 there will be 9.6 billion humans living on Earth. With the rise of the middle class, we are expected to increase our consumption of animal products by up to 70% using the same limited resources that we have today. The cost of producing agricultural crops such as corn and soy to feed these animals is also expected to increase and become more challenging with the onset of drought and rising temperatures. While science is racing to develop more drought tolerant crop strains through genetic engineering, there may be a simpler alternative: flies. Although people in some parts of the world have been eating insects for generations, the general population is opposed to introducing the crunchy morsels into their diet. Since we might not be ready to eat insects ourselves, could we instead feed insects to our farmed animals to feed to growing population? The black soldier fly, Hermetia illucens, is a cosmopolitan species found on every continent in the world (excluding Antarctica). You may have seen this species powering the compost bin in your backyard, as they are efficient decomposers of organic matter. The black soldier fly was first described in 1758 and we are only now discovering its true potential: scientists in Australia, Canada, India, South Africa and the United States have begun transforming black soldier fly larvae into a nutritious and sustainable agricultural feed product. ‘Hermetia illucens’ was first described in 1758 but we are only discovery its true potential now. This species was specifically chosen because of its voracious appetite, with one larvae able to quickly process half a gram of organic matter per day. In fact, the larvae can eat a wide variety of household waste, including rotting fruit, vegetables, meats and, if desperately in need, manure, and quickly convert it to a rich source of fats, oils, amino acids, calcium and protein. Black soldier fly larvae are 45% crude protein, which in addition to its high nutrition profile, has gained the attention of the agriculture community. Researchers have demonstrated that black soldier fly feed could partially or completely replace conventional agricultural feed. Moreover, studies have shown that this feed is suitable for the diet of chickens, pigs, alligators and farmed seafood such as blue tilapia, Atlantic salmon and prawns. Preliminary trials have also indicated that there are no adverse effects on the health of these animals. Black soldier flies can also reduce the amount of E. coli in dairy manure. There are myriad environmental benefits to adopting black soldier fly feed. For example, Costa Rica has been successful in reducing household waste by up to 75% by feeding it to black soldier fly larvae. This has significant potential to be adopted in Australia and could divert thousands of tonnes of household and commercial food waste from entering landfill. One female black soldier fly can have up to 600 larvae, with each of these quickly consuming half a gram of organic matter per day. This small family of 600 individuals can eat an entire household green waste bin each year. 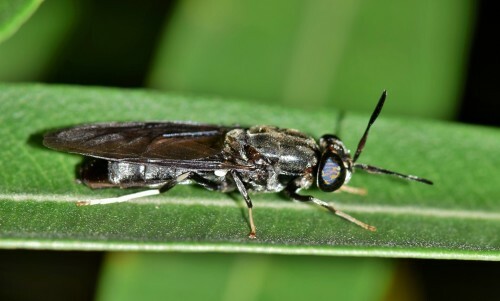 Entire farms of black soldier flies could significantly reduce landfill, while converting the organic matter into a feasible commercial product. 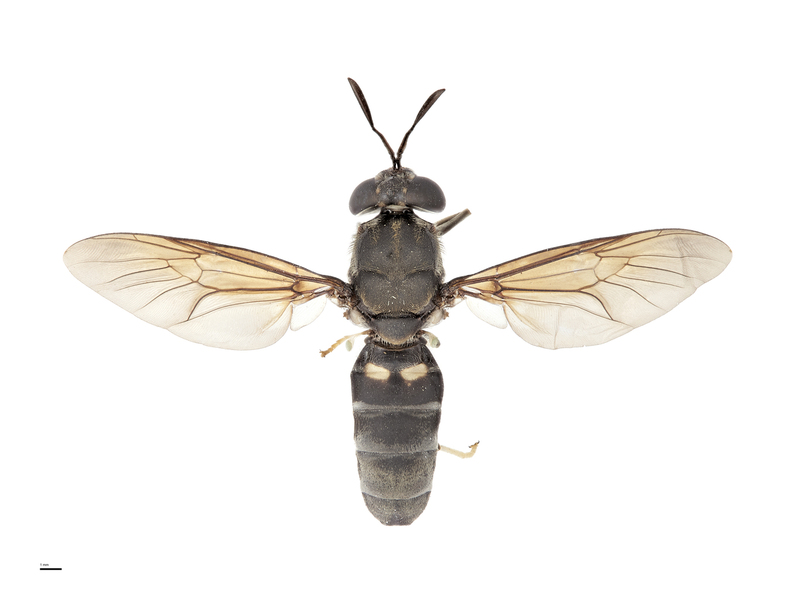 Black soldier fly farms require a substantially smaller footprint than conventional agricultural crops grown to feed farm animals because they can be grown in warehouses or small farms. We currently use more than half the world’s usable surface to grow crops to feed farm animals. If more fly farms were established in the future, less land would be required to feed farm animals, which in turn could be used to grow more food for humans, or rehabilitate it and return it to nature. Another emerging economic venture in black soldier flies is the production of biodiesel as a by-product of the harvesting stage. The larvae are a natural source of oil, which scientists have feasibly extracted during the processing stage and converted into biodiesel. With future research and development, this oil could be commercially developed to alleviate the pressure off limited fossil fuels and could become a reliable source of revenue for countries adopting black soldier fly farming. Would you buy black soldier fly feed? The limiting factor of the emerging black soldier fly farming practice is ultimately the consumer. Would shoppers be tempted to buy animal products fed on black soldier flies at the grocery store, or purchase larvae to feed their pets or farm animals? Promising trials have shown that customers could not detect a difference in the taste or smell of animal products fed on black soldier flies. One of the greatest challenges we will face in our lifetime is the need to feed a growing population. If we want to continue our customs of farming and eating animal products on our limited resources, we may have to look to novel alternatives like black soldier fly farming. With the benefits of reducing household waste and sustainably feeding farm animals a nutritious meal, perhaps the future of eating insects is closer than we thought.